Many elk ranchers are attracted to the industry because of their fascination with the majestic appearance and interesting behavior of the animals, but they make the decision to raise elk after they discover their economic potential. The elk industry has progressed to a level that enables breeders to sell products from their versatile livestock in several markets. The breeding stock market and the antler market have been the major markets in recent years. However, through the foresight of many progressive breeders, a meat market is being researched and developed. The demand for mature, hard-antlered bulls for the game farm market has accelerated as high-quality trophies become increasingly rare in the wild. 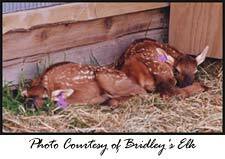 In elk ranching, we have a four-way demand for an animal that is fun to raise and extremely versatile. As an alternative livestock, elk have more history and potential than other contenders. The infrastructure is in place, the animals are available, and the markets are established or are being developed.